Glimmies are one of the hottest girls’ collectable products to hit the toy market. Launched by Flair, these adorable little magical doll creatures automatically light up in the dark and then switch off again when the sun rises. Each one has a passing resemblance to a forest animal. 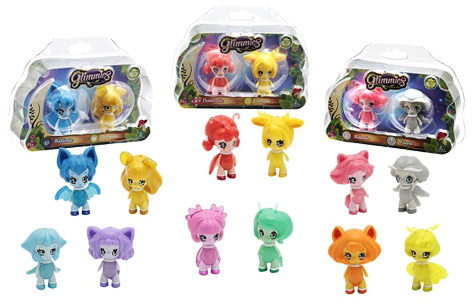 There’s over 20 different Glimmies to collect which are sold in a variety of pack sizes to suit any budget. Place your doll in a lantern shaped Glimhouse House to keep them safe and warm, whilst their gentle glow provides soothing comfort all night through. Each little character has their own name and unique personality. Batlinda has a mass of blue hair and can look rather spooky, whereas Rakella is pink and will be every girl’s favourite! For the technically minded, each Glimmie has a photometric light sensor embedded in the top of their head which reacts to the ambient lighting conditions.